Looking for a spooky October read? Unbreakable is the place to go. It's got vengeful spirits, possessed cats, demons, poltergeists, and more. 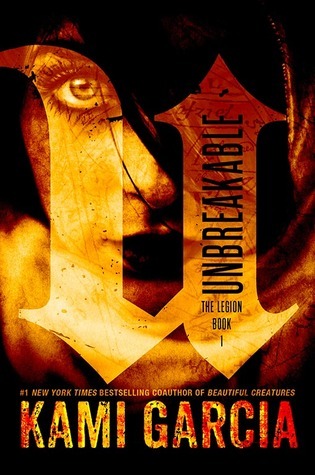 If you enjoyed Anna Dressed in Blood, you'll love Unbreakable. I loved Kennedy, the main character. She is brilliant - born with a photographic memory. But she's also damaged. Her father left when she was young and she's always blamed herself, thinking that he left because of her freakish memory. Her damage increases exponentially when she discovers her mom dead in their home and is then attacked by her possessed cat. It sounds pretty funny when I describe it, but Garcia does a wonderful job at making it feel tense and scary. When Kennedy meets the members of the Legion, she jumps at the opportunity to avenge her mother's death. That's not so surprising, but what I loved was her bravery and selflessness. She was willing to sacrifice herself for other members of the Legion when she barely knew them. I loved seeing how she quickly found a place among the group of demon/ghost hunters through her intelligence, bravery, and kindness. There is a romance in this book between Kennedy and Jared, one of the other Legion members. It's mostly forgettable. Perhaps later books will expound upon it. It veers close to creepy love triangle with Jared's twin brother Lukas, but thankfully avoids that route. My favorite of the side characters was Priest, the Legion's nerdy, weapon building tech guy. He reminded me of a puppy - someone so cute that you want to pat them on the head all the time. Unbreakable is action packed. It is just over 300 pages, but I zipped through it in less than a day - which is unusual for me. The pacing was great. The perfect mixture of scares, backstory, character development, and romance. I loved the eerie ambiance throughout the book. You never knew what was going to hit you next. I read this book because I'm such a huge fan of Kami's Beautiful Creatures series, which she co-wrote with Margaret Stohl (It's called Caster Chronicles, but I think of it as Beautiful Creatures). While I enjoyed Unbreakable, I did not love it the way I do Beautiful Creatures. The wonder of Beautiful Creatures comes from the rich Southern atmosphere, the slowly unfolding plot, and the very detailed world-building. The setting in Unbreakable is unremarkable. The plot goes very quickly and there is a decent amount of world building, but on the whole it feels like that extra element that boosted Beautiful Creatures from good to great was missing. This comparison is admittedly unfair. Unbreakable is a good book on its own and well worth reading; I just wish it was something a little more. I do need a spooky read for Halloween! I know Chayse wanted to read this as well so its looks like we will be fighting to the death over the arc! LOL! I really want to read this one, and it's the perfect time of year to do so. Especially today - it's all rainy, cold, and autumn-like here in Ohio today. I bought this for my library, but I haven't had a chance to look at it yet. Nice to read your review! I know -- that poor, possessed cat! I wasn't a fan of the near-triangle. Did that really need to be? But the story was still quite enjoyable! I'm really curious as to how I'll feel about this - in most reviews I've read, the bloggers have stated explicitly that they enjoyed Unbreakable much more than Beautiful Creatures, which is a series I actually didn't take to at all. You saying the opposite definitely makes me curious as to whether this is going to turn out well for me or not. Well...I guess the only way to figure that out is to actually read it!